The hooded crow, grey crow or “hoodie” as it’s sometimes called, is almost identical to the closely related carrion crow (Corvus corone) except for its distinctive grey and black plumage. The two birds are so similar in fact that until recently they were considered to be different races of the same species, but now hooded crows have been formally acknowledged as a species in their own right. In a narrow strip where their ranges overlap the two species can and do interbreed, leading to fertile hybrid birds that exhibit a varying amount of grey plumage. In Europe the dividing line between the two species extends roughly from Denmark to northern Italy. West of this line the carrion crow dominates, east and south of it the hooded crow takes over. 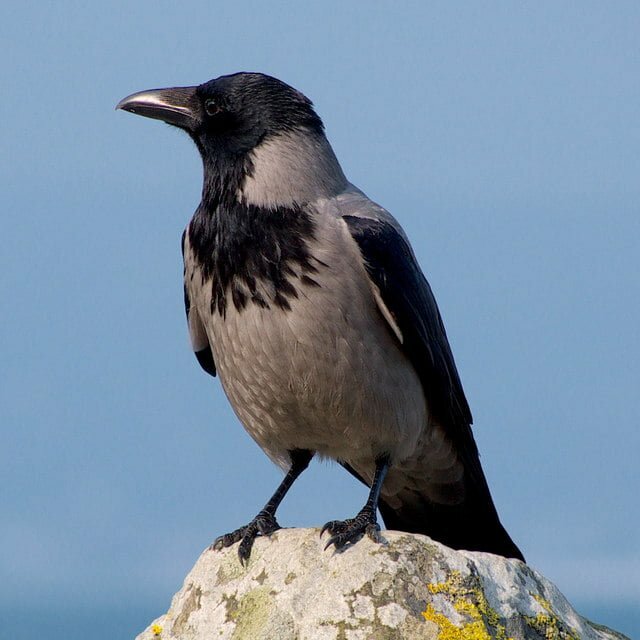 The exception to the rule is the British Isles, with the carrion crow occurring almost exclusively in England, Wales and most of Scotland, replaced by the hooded crow in Ireland, the Isle of Man and Scotland’s north west. Hooded crows are fairly large birds, with an overall length of between 44-51 cm (c. 17-20 inches) long, a wingspan of 84-100 cm (c. 33-39 inches) and weigh in at between 370-650 g (13-23 oz). In Ireland they are common in a wide variety of habitats, including open country with scattered trees and rocky crags, moorland, inland and coastal cliffs, open woodlands, forest margins and mountains areas. They’re also commonly seen in parks and large gardens in our towns and cities. Their harsh and croaky voice is a familiar sound, with a range of typically crow-like calls that includes a ‘kra-kra-kra‘ that some people believe to have given rise to the imitative name ‘crow’. Hooded crows are omnivores and will eat practically anything. Their diet includes typically includes insects, molluscs and other invertebrates; other birds’ eggs; berries and fruit; fish and carrion. They are intelligent birds, and often come up with ingenious ways of reaching a potential meal. In Finland, for example, hooded crows have been observed “reeling in” fishing lines that people have left in ice-holes to get the fish before the fisherman returns. Closer to home I’ve often seen them collecting mussels and other shell-fish near the shore, then carrying them to exactly the right height above the rocks before dropping them to crack the shells and expose the tasty flesh. It’s a delicate operation: too low and the shell won’t crack, too high and it will be smashed to smithereens, making the food difficult to retrieve. Experienced adult birds have honed the technique to a fine art. Sexes are similar in appearance, but young birds have more mottled grey areas of plumage than adults. In spring the hooded crow builds a large nest of twigs in a tree or on a cliff-ledge, typically lined with wool or animal hair. In built up areas the birds may use buildings as surrogate cliff-faces if natural nesting sites are scarce. Four to six greenish blue eggs with brown speckles are laid in the nest from March to May, and are incubated for 18-20 days. Once hatched the young birds stay in the nest for 4-5 weeks before they fledge. Hooded crows rear a single brood of young each year. Hooded crows are common and widespread throughout Ireland, but like other crows they have endured centuries of human persecution. This is largely due to the belief that they kill young game birds and harm livestock – especially lambs. While they are undoubtedly capable of doing some damage in these areas, human perception, as is often the case, tends to be far worse than reality. Hi Calvin, am here in Bandon and have been befriended by what first appeared to be a young crow, but now appears to be a hooded crow. Have noticed that the more she befriends me, the more other crows, previously welcome, keep their distance. Am concerned for this as as it occurs to me that she might become scaoegoated? Any ideas? Hi Calvin, as I write I’m looking at a pair of hooded crows refurbishing the nest they built last year. As it is still only early November ,is this normal for hoodies? Regards John Skally.